In the spirit of celebrating one of the great women in our family tree, I will share a fun little story that I found in the Colorado Online Historic Newspaper Collection. Vesta Price was born on October 24, 1890, in Buena Vista, Colorado, her father, Thomas Price, was 51 and her mother, Flora Ann Hill, was 29. She married John Arthur Ross Fitzpatrick on June 5, 1910, in Mesa County, Colorado. John Art and Vesta had seven children in 20 years. 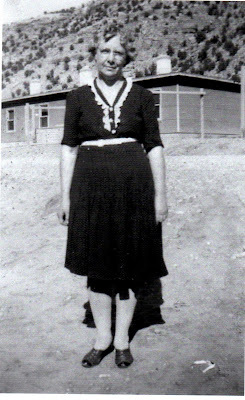 Vesta died on July 20, 1988, in Grand Junction, Colorado, at the age of 97, and was buried in Cedar Crest Cemetery in Collbran, Colorado. Vesta and John Art met in Collbran and lived there until they moved to Grand Junction during World War II. 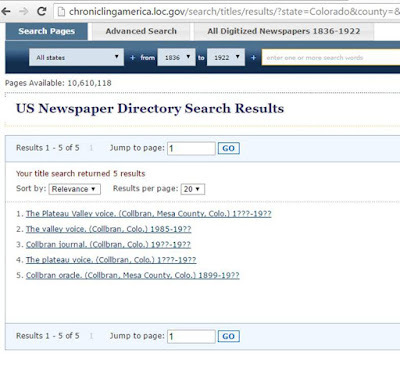 It was with great excitement that we learned that the newspapers from Collbran were available online at www.coloradohistoricnewspapers.org. All weather conditions being just right Mrs. J. A. Fitzpatrick [Vesta Price, 1890-1988] and [her sister-in-law] Mrs. Karl Price [Clara Pitts, 1893-1971] planned a party for the little school folks, 1st, 2nd, 3rd and 4th grades last Saturday evening at the Fitzpatrick home, hours 6 to 9. About forty of the little folks were greeted at the gate by huge, beaming faces as harbingers of the mysterious surprises held within. Common games were played for a while till the crowd had gathered. Then all were taken into the house to see a "circus." Near the door stood a black bear (the "preacher's bear") and some of the smaller children shied off only to be stared at by the "Old Original Witch of Endor" and more jack-o-lanterns and then assured of the fun of it by a very tame kitten in a cage, representing the tiger. The "cabbage head", the ¦ "old woman that lived in the shoe", the caterpillar, the South African zebra and others were funny surprises. The greatest bat in captivity (baseball bat) was hidden, behind a curtain and only a hurried glance allowed lest it escape. The "great North American monkey" was securely caged near the ceiling and it was very funny as well as interesting to see the expectancy and wit of _the children as each climbed to the top step of the _ladder and looked into the cage which held only a looking glass. The circus over, all were taken into the grove where a big bonfire, well surrounded in the distance by more Jack-o-lanterns, awaited them. Also a tub of apples and sacks of pop-corn, candy and peanuts and for more substantial "fillin" sandwiches, pickles and cake. Last of all the bunch, one by one, _was blindfolded and sent to the house to pin a tail on the donkey. The girl winning the best prize for getting the tail nearest the right place was Ethel Thompson; the boy, Richard Snider. The boobie prize went to Robert Franklin and Mabel Hill. By this time the clock had begun to strike nine and good-byes were said with cheers and noise as only a bunch of happy youngsters are capable of and each said, "Oh! I'm so glad I came." Coincidentally, we had a great presentation on Friday night by Kim Zrubek of the Friendswood, Texas Public Library about the Chronicling America newspaper collection. Before we get lost in endless searches for all of our family in this great newspaper site, Kim recommended that we click the U.S. Newspaper Directory link in the upper right hand corner of the Chronicling America home page. 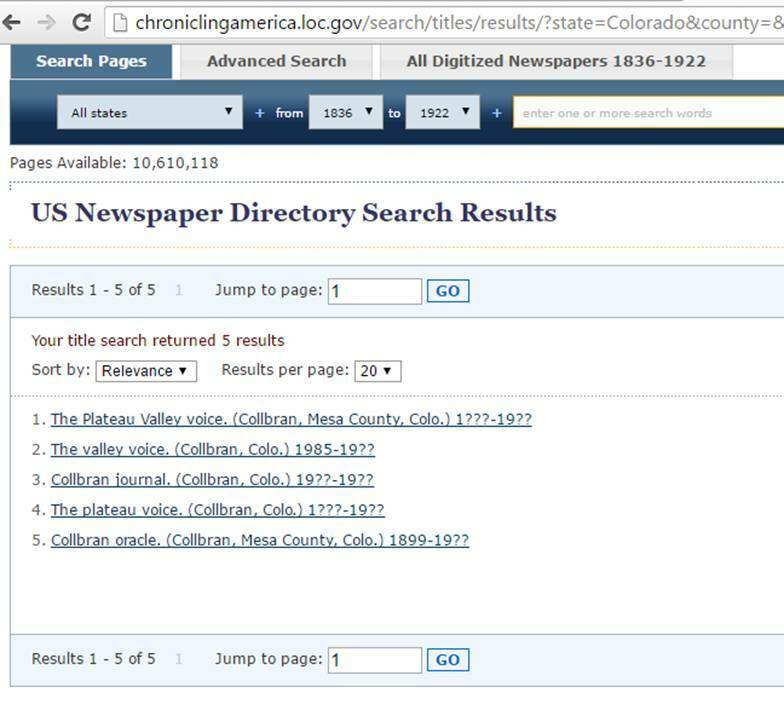 You have the option to browse the directory by title or to select where the newspaper was published by state, county or city. 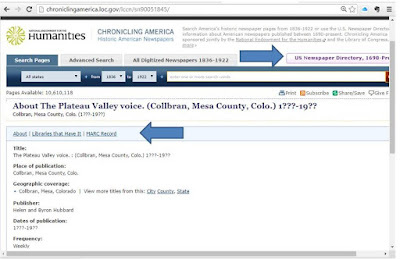 Clicking on the links for each paper leads to more information about the paper and a list of libraries that have it on microfilm. This can be especially helpful if you are looking for an obituary or wedding and anniversary announcements. The Mesa County Library carries microfilm of The Daily Sentinel back to 1893. The microfilm is located on the lower level of the Central branch. An obituary file is located next to the microfilm and is available for your use. 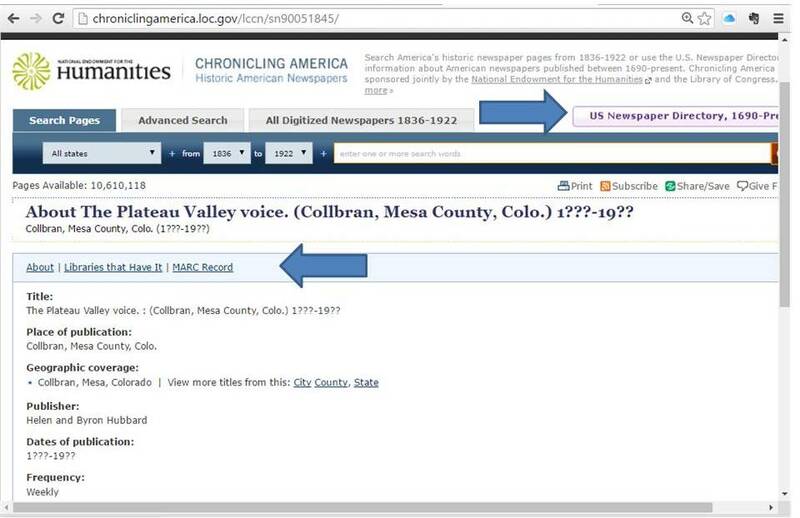 Library staff can also access an electronic database to search these obituaries. Ask any library staff if you have questions. Also, if you are from out of town or are otherwise unable to visit us, library staff will search our microfilm holdings and send requested obituaries via email. To request one, write to ask@mcpld.org. Please include: last name, first name, birth date and death date of each individual you are seeking an obituary for. You will typically receive a response within 5 business days. Best of luck in your newspaper searches. Thanks to Kim and all of the librarians out there for their wonderful services. Hopefully you can find some gems like the article that we found for Grandma Vesta! This place is absolutely gorgeous, beautiful and stunning. Even though a few party venues are equally appealing and fascinating in their decor, food and aesthetics, I'm tempted to still give this place a slight edge.